Jim’s Orchid Supplies to see their wide selection of high-quality products. Ryan: How did Jim’s Orchid Supplies come about? How long have you been in business? Jim: About 17 years ago my wife Debbi wanted to start a home-based online mail order business but had no idea what we should sell. We had been growing orchids for several years. Going to local orchid shows we would see things like cork, tree fern, clay potting mediums, and so on. Items that could not be found locally and at that time had very limited online or local sources. We searched for and found sources for these items and many more. From there Jim’s Orchid Supplies was born. Ryan: What’s one item (from your store) you think all orchid growers should know about/own? Jim: That’s a tough question because there are so many items to pick from! Nutricote – 13-13-13 a 6 month timed release fertilizer. Pot Klips – clay pot hangers. Mega Thrive – a specially designed liquid formula optimizes plant growth: this is a new item and becoming very popular among orchid growers. Word of mouth is spreading. Many of our local customers are using and raving about the results they are seeing. Ryan: What orchid potting mix (from your store) would you recommend for orchid growers that need to re-pot their Phalaenopsis orchids? 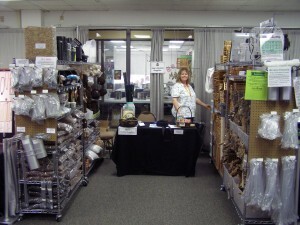 Jim: I would have to say the most popular among our customers wound be bark mix, (bark, charcoal and sponge rock). Smaller variety Phalaenopsis do great in fine bark mix and larger growing plants in the medium bark mix. Where Can I Purchase These Orchid Supplies? Ryan: Do you have a retail location our readers can visit? Do you attend/sell at local orchid shows in Florida? Jim: We are home based and not setup as a retail store. We can see customers by appointment. 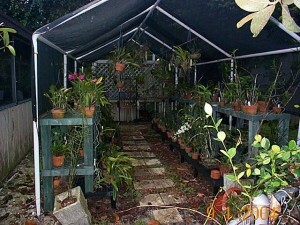 We do about 10 local orchid and plant sales annually. Many local customers catch up with us at shows or orchid society meetings. Ryan: I noticed you prominently feature your ventilation devices on your website. Can you talk about the importance of ventilation and when you should consider using a special cooling fan for ventilation? Jim: Here in South Florida most of our hobby customers grow outside. In other climates where growers are utilizing greenhouses or indoor growing areas, ventilation is in most cases a must. Fresh air along with good air flow is essential for healthy orchid growing. Ryan: Many of our readers ask me about mounting their orchids. I know that you talk about and offer cork bark on your website. What advice do you have when it comes to mounting orchids? And what materials would you recommend? 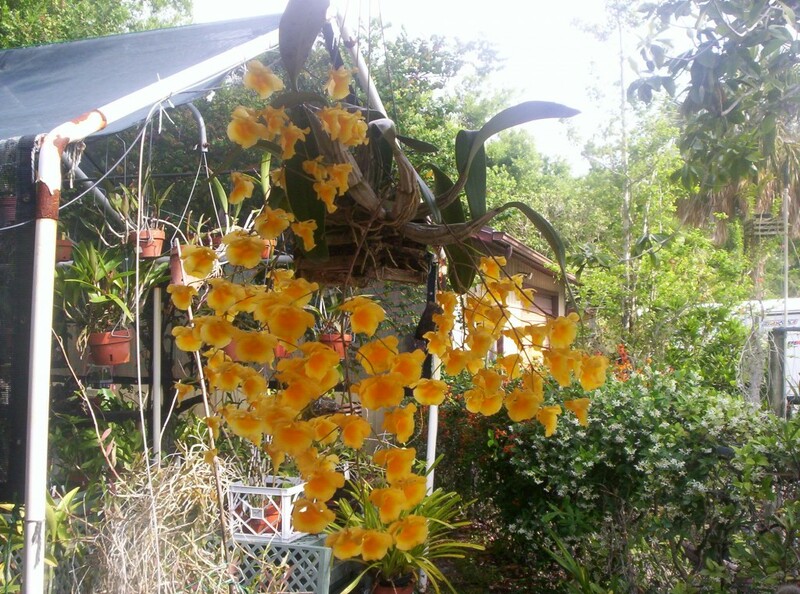 Jim: Many commonly grown orchids are “Epiphytes” (in nature grow on trees but are non-parasitic). Cork, tree fern and wood mounting plaques are among the most common mounts. Cholla cactus wood skeletons also works very well. Clean driftwood and other rot resistant materials can be used also. We use a small amount of sphagnum moss or coconut husk fiber around roots when mounting. This holds some moisture and helps while the plant is getting established and rooting to the mount. Water a little more until plant is established. You can find our mounting supplies on our website here. Ryan: Do you grow orchids? How many do you have? Where do you grow them? Jim: We have about 200 orchids. We grow in a 20 x 10 shade house and under trees. Jim: Can’t really say I have a favorite. The problem is I like them all LOL. 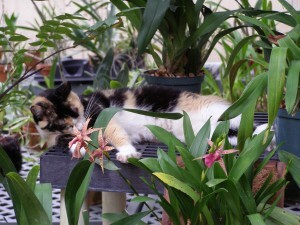 We have a variety: Cats, Dens, Onc, Phals, Vandas, etc. Most are hybrids with some species. I guess my favorites at any given time are the ones flowering. Jim: When repotting or mounting make sure the plant is secure in the container or mount. If a freshly mounted/potted plant is flopping around you are almost surely going to lose the plant. I sometimes use 3 or 4 rhizome clips for 1 plant, same can be said for wiring on a mount. Jim: If you have an orchid society in your area, join! Society meeting are a great source for information from growers growing in similar climates and conditions. They can also be a great source for building your collection. As a 3 term past president of the Fort Pierce Orchid Society, I can tell you belonging to and being involved in an orchid society can be very rewarding! Jim & Debbie Jarvis, owners of Jim’s Orchid Supplies, strive for customer satisfaction. Their business would not have survived for 15 years without their loyal and valued customer base. To learn more about all of their products, click here. And remember, by signing up as a member of the Green Thumb Club today, you’ll save 20% on Jim’s Orchid Supplies. After becoming a member, you’ll get access to a special coupon code (not available to the public) which you can use to get the discount off the site.